InfoWorld is reporting a survey suggesting that Apple’s laptop sales are growing fast while Dell’s have fallen to an historic low. This made me wonder whether the announcement 18 months ago that Apple was, for a while, worth more than Dell, still held true now. 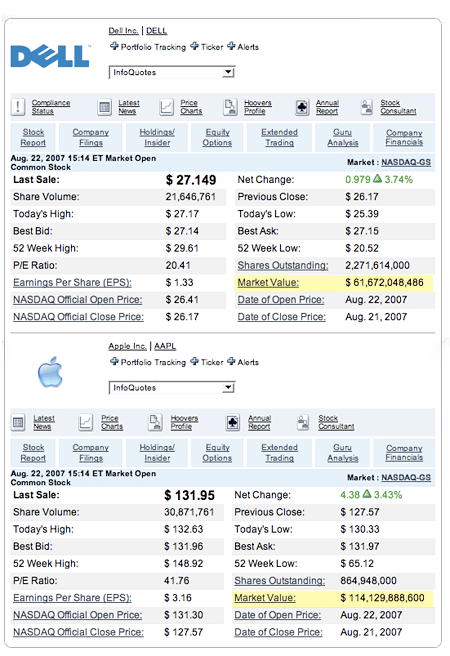 I headed over to NASDAQ and, to my astonishment, not only is Apple worth more, it’s worth nearly twice as much. Wow.